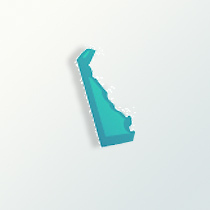 A peninsula bordered by the Chesapeake and Delaware Bays, the state of Delaware was one of the original 13 colonies. It became a state in December 7, 1787. As the second smallest state in land size, it has seen many ethnic groups on its shores. Henry Hudson, the English explorer, spotted Delaware Bay in 1609. The first to attempt a settlement were the Dutch in 1631. They were quickly driven out by the native Indians. The region became New Sweden in 1638 and was settled by immigrates from Sweden. It was held by Sweden until 1655 when the Dutch reclaimed it as New Netherland and had settlers from Finland and the German Mennonites as well as additional Dutch immigrates. The different groups in this small area is important to know as it relates to Delaware genealogy. The Dutch also brought in many African slaves to Delaware. Under the English leader, the Duke of York, the Dutch lost their hold in Delaware until 1673 when they reclaimed it for a year. The English held it again until 1682. It was then that William Penn had Delaware made as one of the counties of Pennsylvania. It remained in that situation until the beginning of the American Revolutionary War. From the late 1600s into the mid-1770s, many English citizens settled in Delaware, some being Quakers from other colonies came to Delaware. After the American Revolution, many people left Delaware for cheaper new lands which opened up further south. During the early 1800s many slaves in Delaware were given their freedom. Another ethnic group, the French from the West Indies, after the 1789, came in large numbers to settle in Delaware. One family, the duPont family, from the nation of France became well-known in Delaware starting in the 1790s. By the 1850s large surges of emigrates from Irish Catholics and to Germans arrived in Delaware. In the town of Wilmington, in the 1880s and 1890s, there were families from Italy, Poland, along with people from the Scandinavian countries and Eastern European countries. Over the years most of the population have remained in the northern end of the state and agricultural lands in the southern end of Delaware. The Delaware genealogy heritage of the citizens of Delaware range from African-Americans at 19 percent of the population, followed by the Irish at 15 percent and Germans at 14 percent. The total population has gone from 184,700 in 1900 to 885,000 in 2009.